Your love will last forever. 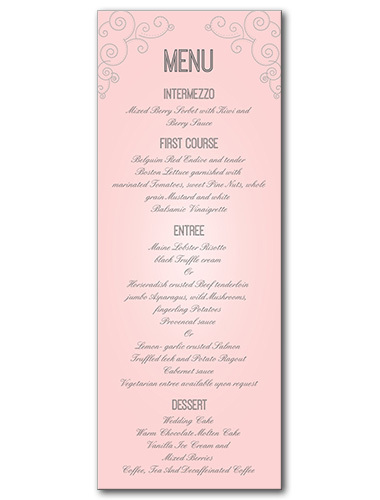 This is what we had in mind when creating our striking Always and Forever menus. A bright and playful pink backdrop is highlighted by understated scrolls and swirls in each corner, offering the perfect balance of uniqueness and fun with old fashioned elegance. Use the font suggested to keep with the one of a kind look, or pair with a more traditional wedding font to create your own look. Comes in both invites and save the date cards, so you can easily coordinate items for a tailored wedding ensemble. Always and Forever Menu For the best experience, we recommend personalizing your stationery on a desktop computer.